Here's Tuff Luck and Wolfgang lying down in bed together naked holding their newborn cubs. It all started when Tuff Luck was confronting Wolfgang when he was invading a village of elves. However, she got knocked down unconscious by him and then was taken to his place, where the feline got raped by the werewolf himself, impregnating her. Tuff Luck was now pregnant with Wolfgang's cubs, and also stuck being his slave. When her fellow Trap Masters came to save her, Snap Shot and Wolfgang engage in a fight against each other, but when the crocagator was about to deliver a finishing blow against the werewolf, Tuff Luck stopped the fight and told them it's too late to save her because she was gonna be a mother to Wolfgang's babies, which Wolfgang then took off with her. Wolfgang admits he doesn't know how to be a father, but his fellow Doom Raiders helped him be one, while Tuff Luck had a baby shower with her fellow Skylanders. 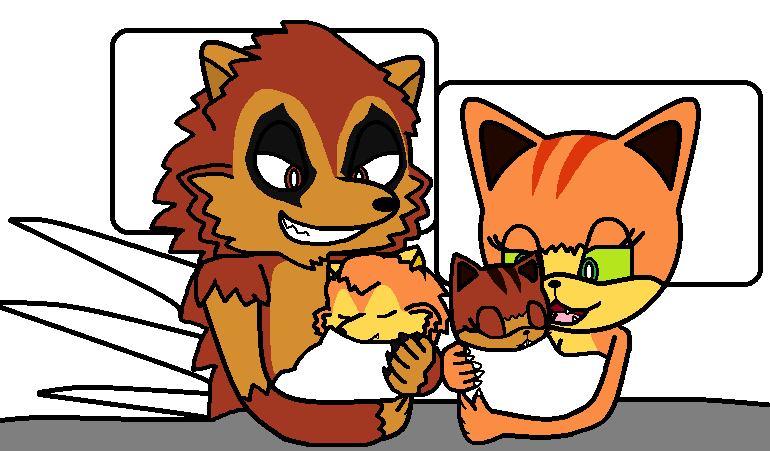 As months passed, Tuff Luck finally gave birth to twins as she and Wolfgang became parents, and named their son Wolfborne *A werewolf pup*, and their daughter Lucky Clover *A kitten*.